Five Countries, Four UNESCO World Heritage Sites! Discover Ottoman splendors, Byzantine and Eastern Orthodox Monasteries, ancient sites and dramatic landscapes on this 11-day Balkan gay tour from Skopje, Macedonia to Sarajevo, Bosnia-Herzegovina. Bordered by the Adriatic, Mediterranean and the rugged Dinaric Mountains, diverse cultures have jostled and left their legacy across the Balkan Peninsula, Europe's oldest continuously inhabited land. Macedonia, Kosovo, Albania, Montenegro, Bosnia & Herzegovina and Serbia all lie entirely within the Balkan Peninsula, a word of Turkish origin meaning "chain of wooded mountains." Once part of the former Yugoslav Republic, Macedonia is a land of contrasts, ranging from Skopje, with its modern shopping centers and timeless Turkish baazar, to the medieval monasteries of Ohrid. 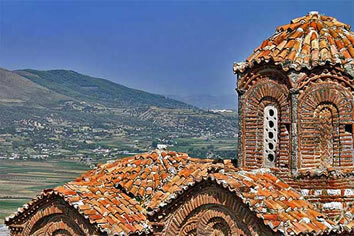 Macedonia's blend of Orthodox mystery and the exotic Ottoman legacy combine with the world-class beauty at Lake Ohrid. If you wondered about places where Americans are truly liked, visit Kosovo with us — where a statue of Bill Clinton stands in the capital, Pristina. 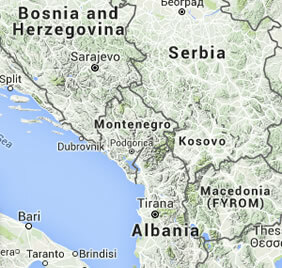 Largely Albanian-speaking and Muslim (though secular) Kosovo declared independence from Serbia in February 2008. Albania is Europe's last unknown, with enchanting classical ruins at Durrës, the charming museum town of Berat, vibrant cities like Tirana and Korça, colorful folklore and majestic landscapes of mountains, forests, lakes and sea. 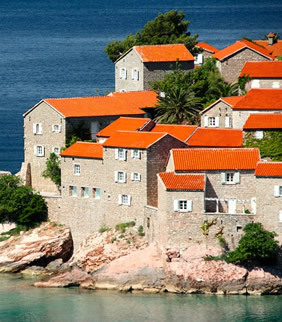 The coast of tiny Montenegro, where rugged mountains plummet to the Adriatic, is bejeweled with walled medieval cities, with a resplendid Venetian legacy. Bosnia & Herzegovina is simply stunning, struggling to regain its culture of tolerance where Croats, Serbs and Bosniaks mix and mingle. The ancient bridge at Mostar, rebuilt stone-by-stone after the war is an elequent testimony and Sarajavo, an Ottoman-tinged surprise. 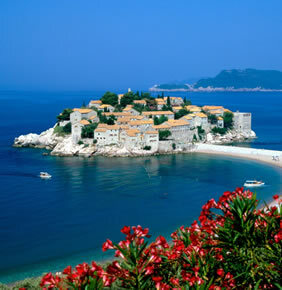 A trip through the Balkans will be enriching and inspiring. Since tourism from North America is almost non-existant, the infrastructure in these countries is nice and comfortable, but somewhat lower standards than what is found in Western Europe. The tour is a classic motorcoach tour, but distances are mostly short. We are rewarded with amazing sights, a thriving culture and warm, welcoming people. Depart the USA, Canada on any regularly scheduled flight to Skopje, Macedonia. Flights serving this itinerary are on United, Lufthansa, Turkish & Austrian. The airport code for Skopje is SKP and for Sarajevo on the return is SJJ. No visas are required for US, Canada & EU travelers. Upon arrival in Skopje, Macedonia, you may book a transfer with Coda Tours to be met at the airport and transferred to the hotel. Check in to the Marriott Hotel Skopje, centrally located in Skopje. The afternoon is at leisure to relax after the flight. This evening we will depart for a local restaurant for our Welcome Dinner, with fellow tour participants. After breakfast, we tour Skopje. Macedonia is a country of 2 million, 30 percent of them ethnic Albanians. Obstructed by Greece from becoming part of the European Union (due to conflict over the use of the name Macedonia), today Macedonia is a divided nation with an uncertain future. In the last five years, Skopje has become the world capital of kitsch. We will discover the massive statuary of Alexander the Great, his mother, Olympias, and father, Phillip II, and listen to a local artist give a personal view point of their artistic merits. We will also see the home of former local resident, Mother Teresa, and the beautiful Church of Saint Salvation. Finally walk through the Albanian quarter – a world removed from Orthodox Skopje. After breakfast, we drive to neighboring Prizren a charming city of mosques and monasteries dating back to the 14th century. After we drive to neighboring Pristina, capital of the Republic of Kosovo, just 50 scenic miles away. We stop en route at the site of the June 28, 1389 Battle of Kosovo, where the fate of Serbia was sealed, marking the rise of Ottoman influence over the entire Balkan region for the next 500 years. We continue to Gracanica Monastery, completed in 1321 by Serbian King Milutin. This striking complex, one of the UNESCO Medieval Monuments in Kosovo, is an active religious center and Serbian enclave in largely Albanian-speaking and Muslim Kosovo. We visit the Pristina Museum, the Bazaar Mosque, the Clock Tower and the Mosque of Sultan Mehmet Fatih, followed by a stroll along the main street of Pristina. We return to Skopje for overnight. Enjoy dinner on your own this evening in one of the lively local restaurants. Departing Skopje this morning, we drive southwest to the Monastery of St. Naum — dramatically set on rocky outcropping over Lake Ohrid, high above deep forest and the springs of the river Crn Drim. Here we board a boat for a cruise across the serene lake, which has captivated visitors since prehistoric times. Writing, education and Slavonic culture all spread out from remarkable Ohrid town in the 7th to 19th centuries. Among the extraordinary collection of monasteries, ancient buildings and medieval chapels, Ohrid has the oldest Slav monastery (St. Pantelejmon) — and more than 800 Byzantine-style icons. Orthodox Byzantine monks brought Christianity to Ohrid in the 10th century from Greece through the effort of Saints Cyril and Methodius. We check in to our hotel set along the lake with dinner tonight in the hotel. En route today to Tirana, capital of Albania, we stop at the fortified city of Berat, a splendid UNESCO-designated example of the coexistence of Islamic and Ottoman traditions. Its castles and fort date back more than 2,400 years. We visit the Old Quarter and the icon museum of Onoufri, Albania's master iconographer, and stop along the way at Helveti Tekke, a Bektashi Sufi shrine and another testimony to the long history of tolerance in the region. We continue to Tirana, where we spend two nights. After breakfast we join our guide for a tour of Tirana and neighboring Kruja, — home of Albania's national hero, Scanderbeg, who famously recaptured the city and defended it from the Turks in the 15th century. We visit the Old Castle, Scanderbeg Museum and spend time at the Turkish-style bazaar before returning to Tirana for lunch and some time at leisure to explore this city on your own. Today we travel north through an old and historic region of Albania. We visit Rozafa Castle, an Illyrian stronghold near Shkodë, and continue along the Adriatic coast to the walled seaside town of Budva in Montenegro. En route we pause for lunch and a cruise on Lake Skadarsko, largest in the Balkan Peninsula. Our hotel, where we spend the next two nights, is a unique resort located directly on the beach and only 50 m away from the Old Town of Budva. Today we drive along the spectacular Dalmatian coast to medieval, fortified Kotor, which commands a gorgeous, deep, natural harbor in Montenegro. A part of the maritime Venetian Republic from 1420 to 1797 (interrupted by periods of Ottoman rule), Kotor retains much of its Venetian legacy. Set on a dramatic bay, the city was designated a UNESCO World Heritage Site for both its cultural and natural riches. It has one of the best preserved medieval towns of the entire Mediterranean. Autumn is a marvelous time to enjoy the Adriatic. After Lunch continue to Mostar, Bosnia-Herzegovina and check in to our hotel. Mostar in the center of Bosnia-Herzegovina. The scenery climbing from the coast is spectacular, with Mostar dramatically set on both sides of Neretva River. We wander cobbled alleys and watch the famous divers from the symbolic Old Bridge (Stari Most), painstakingly rebuilt since its destruction in the war, and tour the Ottoman Muslibegovic House, a Bosnian National Monument. After lunch continue to Sarajevo the capital of Bosnia-Herzegovina. Today we explore the wonders of Bašcaršija, Sarajevo's 15th-century bazaar and old town spread out along the Miljacka River. A moving highlight is a tour of the Sarajevo Tunnel. Built between 1992 and 1995, the tunnel allowed food, war supplies and humanitarian aid to come into the city — and for its people to get out. Stand on the site where the Arch Duke Ferdinand was shot, sparking World War I. Enjoy sitting in a café, doing some shopping or exploring more of this fascinating city in the afternoon. The morning is at leisure in Sarajevo. Fly this afternoon to Belgrade and upon arrival, transfer to the Hotel Hyatt or similar. The remainder of the day is at leisure. This evening, we will go out to dinner at a local restaurant. Breakfast at the hotel. Tour Belgrade this morning. Visit Kalemegdan Fortress & Saint Sava Cathedral and see Kalemegdan Park & Knjez Mihalilova Street. Lunch at a local restaurant. Drive to historic Novi Sad, the second largest city in Serbia. 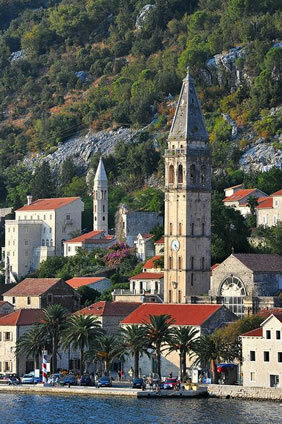 Tour the old quarter – Stari Grad – and the 17th century Petrovardin Fortress. Lunch in Novi Sad. Return to Belgrade in the late afternoon. This evening we dine together. • Breakfast daily in the hotels. • 8 lunches & 5 dinners. • Deluxe motor coach throughout the trip. • Professional English-speaking Coda Tour Leader to accompany the group throughout the tour. • Professional English-speaking guides where required. • Gratuities to guides, drivers and Coda tour leader. Skopje Marriot Hotel is set in Skopje, 100 m from Macedonia Square and 200 from Stone Bridge. The hotel offers a spa centre with an indoor pool and facilities such as hot tub, massage and steam room. Kale Fortress is 800 m from the hotel and Skopje City Museum is 650 m away. The nearest airport is Skopje International Airport, 24 km from Skopje Marriott Hotel. Each room at the hotel features air conditioning, flat-screen TV with satellite channels, kettle and a safety box. A private bathroom is with free toiletries and hairdryer is also included. A buffet breakfast is available every day at Skopje Marriot Hotel. Guests can also enjoy their meals at the property's restaurant serving Mediterranean and European cuisine. At Hotel Izgrev Spa & Aquapark you will find a spa and wellness centre with a hammam, sauna, fitness centre and massage service. Tennis court and mini golf are also available. All rooms are air-conditioned and come with a balcony and a flat-screen TV. Private bathrooms are fitted with a bath tub or with a shower and a hairdryer. You can enjoy lake view from the room. Some units feature a fireplace, a private pool and a safety deposit box. The on-site a la carte restaurant offers both traditional and international cuisine. Guests can also relax at the bar by the outdoor pool. Offering a spa centre, sauna and hot tub, Hotel Plaza Tirana is situated in Tirana in the Tirana County Region, 200 m from Skenderberg Square. The guests can enjoy a drink at the bar or have a meal at the restaurant. Clock Tower is 100 m from Hotel Plaza Tirana, while National Theatre of Opera and Ballet is 200 m from the property. Offering free access to an indoor pool and a spa and wellness centre, Hotel Mepas is located in Mostar, in the very centre of town. A shopping centre with various entertainment and shopping options is located right below the hotel. Free WiFi access is available. Each room here will provide you with a TV, air conditioning and a minibar. Featuring both a shower and a bathtub, the bathrooms also come with a hairdryer and bathrobes. Extras in all rooms include a seating area, satellite channels and pay-per-view channels. At Hotel Mepas you will find a restaurant and a fitness centre. Other facilities offered at the property include a congress centre, a tour desk and luggage storage. The shopping centre also features a cinema, caffee bars, shops, a bank, an exchange office, a hair salon, and a bowling centre. Situated in the heart of Sarajevo, Residence Inn by Marriott Sarajevo is 900 m from the the lively Bašcaršija District and 750 m from the Latin Bridge. The hotel guests have free entry to the sauna and fitness centre. Free WiFi is provided in all areas and high-speed WiFi is available at a surcharge. Marriott Residence Inn runs a 24-hour front desk and provides a complimentary grocery delivery service. A rich continental breakfast is served each morning. The stylish accommodation options at Residence Inn include spacious self-catered studios and suites with living area that comprises a 40'' LCD satellite TV. All units come with a fully equipped kitchenette that comprises a hob, dishwasher and microwave. National Theatre of Bosnia and Herzegovina, as well as Sarajevo Film Festival Square and Ferhadija Street lined with cafes and shops can all be reached within 200 m. The city hall is at a distance of 1.2 km. The 5-star Hyatt Regency Belgrade hotel enjoys a convenient location in Novi Beograd's business district, between the Beograd Airport and the Old Town. It features various restaurants and a luxurious spa. Standard internet access is provided free of charge, while higher speed access is available at a surcharge. A choice of international cuisine is served in the on-site restaurants and a wide range of teas, pastry and other drinks can be enjoyed in the Tea House. It invites you to unwind while listening to soft, jazzy tunes. The elegant rooms are decorated in soft pastel shades and overlook the centre of Belgrade or the park. You can benefit from the complimentary use of our Club Olympus Fitness Centre & Spa which includes a sauna, steam rooms and gym to pamper yourself after a busy day. Holistic treatments and massages are available from professional therapists and are being charged additionally. Skopje Airport Transfer $50 (per car); Sarajevo Airport Transfer $50 (per car).